When people think of popular light novels in recent years, what often comes to mind may include long titles, high school setting, and romcoms with fanservice. The long-winded My Youth Romantic Comedy is Wrong as Expected (which I’ll refer to by the Japanese shorthand Oregairu) meets each of these expectations, yet manages to tell an engaging number of interconnected short stories regardless of its reliance on familiar plot elements and character archetypes. It’s worth noting that this particular series has achieved great success in Japan, even placing first in 2014’s Kono Light Novel ga Sugoi! contest rankings. What is it that makes Oregairu stand out from the crowd? If I were to pin it down to one thing, it would surely be the protagonist and viewpoint character, Hachiman Hikigaya (who placed first in 2014’s ranking for male light novel characters). Hachiman is a pragmatic loner who views the notion of idealized high school youth as a complete farce, and spends much of his time brooding about the hypocrisies inherent in modern student life and society. The story places him in a volunteer club against his will, which serves as a means for him to interact with other classmates–namely two girls who serve as foils to Hachiman in different ways: the elite and cavalier Yukino, and the trendy and simple-minded Yui. They end up assisting a number of students in slightly unorthodox ways, which makes for a plot that is both seen through and propelled by Hachiman’s cynicism. This strong and unique viewpoint is what makes Oregairu effective in its themes, character interactions, and various story arcs. More so, I imagine many readers will find it easy to relate to Hachiman, and find there’s a lot of sense to his twisted interpretations of all that makes up day-to-day school life. It’s a Watamote-like experience you don’t find often in the world of light novels, anime, and manga–and manages to hook the reader with both its humor and its more down-to-earth character drama. 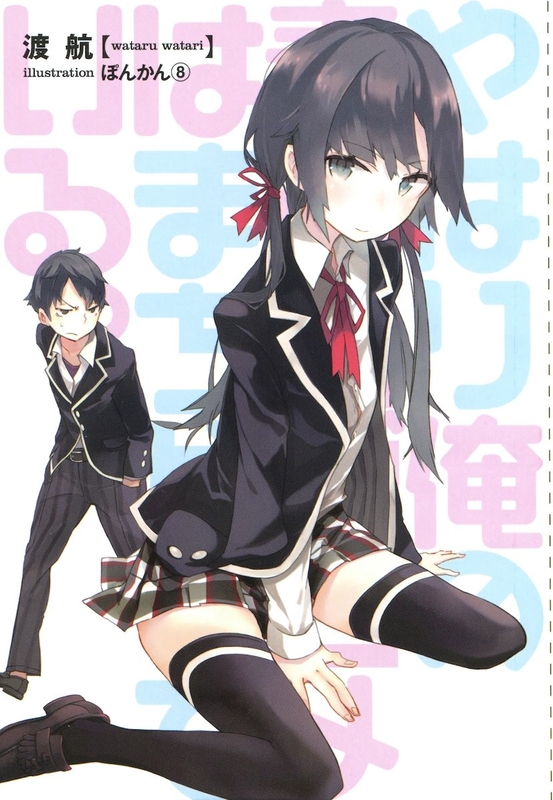 All that said, I personally found myself bored with Oregairu‘s first volume for much of my readthrough. Part of this may be due to the translation, which seemed to have a dozen footnotes every few pages to explain the story’s many, many Japanese pop culture references (to the point I eventually just stopped bothering to read them). And another part of this may be due to my having seen the first season of the anime already. But really, the biggest reason comes down to the fact the story just rambles on and on and on and on and on. Hachiman’s stream of consciousness turns out to be a double-edged sword–the vehicle for the book’s many memorable spiels also serves for page after page of delving into needless details, constant rehashing, and bizarre non sequiturs. To some degree this can be considered part of the book’s charm, but for many readers it may just be too much (in which case I’d say stick to the much snappier pacing of the anime adaptation). Overall the book is an interesting read–and at times surprisingly exceptional in its prose and content–but I will still note the one caveat that it’s not going to be a particularly smooth read. Interesting how you bring up the sheer number of translation notes in volume 1. That was one of my main issues with the translation as well. ND encourages translators to use footnotes instead of localising the text, although that’s not a rule of thumb I readily agree with. Would you have preferred it if the translation had taken a few more liberties with the material to make it more digestible? I feel much of the humour of Oregairu is lost when most of the puns and references are explained to you through translation notes! The topic of footnotes is an interesting one–I feel it ties in directly with the more general issue of translation vs localization. Everything has to be dealt with on a case-by-case basis I’m sure, but in general I feel like more often than not, a balance can be achieved in the text itself through careful wording (…which may call for some creative liberties at times–particularly where comedy is concerned). Brief explanations (when necessary) can generally be worked in without breaking the flow of the author’s original text, I believe. I imagine the situation is extra-difficult with Oregairu though, since it is clearly filled to the brim with references and Japanese humor to work with. Since an audience outside of Japan–even among those in the anime/manga fandom–wouldn’t readily follow such a large chunk of these particular ramblings, it almost makes me wonder if some of them could just be left out? Seems like it would be a difficult decision to make, especially when (from what I’ve gathered) the fan translation world generally leans more toward direct translation than loose localization (at least when compared to official translation efforts). I’ll probably still get to volume 2 at some point though, as I am curious how the story develops in general. As Froggy said footnotes are a tricky issue… I wouldn’t say we have an official stance on it really, but if a translator isn’t confident he/she can localize a reference successfully (which can be rather difficult and often impossible, especially with a novel like Oregairu), I tend to recommend erring on the side of caution and footnoting it. I’d say the cost of a failed localization and loss of cultural significance/content is much greater than the cost of potentially bugging a reader by breaking up the text with a footnote (and our footnotes are at least relegated to the end of the section, whereas I’ve seen people who just use parenthetical “footnotes” right after the text in question, which are much more intrusive). In all situations other than translation of cultural references, I try to encourage translators to stray away from literal translations. Looser translations read better, and ultimately it’s just a matter of how secure the translator is in their command of either language to pull these translations off. But the crucial difference here is that while most ideas in these novels are culturally/linguistically nonspecific (X boy likes Y girl, X protagonist works hard to achieve goal Z, etc. etc.) and thus can (in theory) be nearly perfectly translated, anything that would warrant a footnote usually cannot be. Furthermore, because as fan translators we’re never thinking about how to sell our work to a broader audience, I tend to be much more fiercely loyal to the original work’s content than to concerns about accessibility (and thus marketability). That’s just my own philosophy though and not official group policy or anything – I’ve seen translators all over the spectrum on this with perfectly valid positions. Either way, it’s a tricky topic and there is no right answer. I’d say that in practice, it’s often best to just allow the translator a bit of poetic license to do the footnotes like he/she wishes within reason, even if you’d do it differently yourself. Thanks for the comment, NanoDesu! Footnotes (and associated aspects of fan translations) definitely constitute a big topic here–perhaps it would even be worth an editorial post of its own at some point. I agree it’s good to leave these issues up to the translators though, as they’re the ones going through all the effort on the projects. I’d be curious to see how a series like Oregairu would be handled in an official release though, as I find the localization process intriguing. Some light novels do get footnotes, but generally no more than maybe two or three in a chapter (or section). I haven’t read it, but maybe something like NGNL has a similar level of referential humor? Will have to watch for reactions to that one, perhaps.